If you’re creating content online, you’re part of the largest office in the world. You’ve got your virtual water cooler (Twitter), “office parties” if you go to events like NMX, and – yes – office drama. People talk. Are they talking about you? Are you part of the “office” drama? If so, you could find yourself on some digital blacklists. Yes, they do exist. So what if some people don’t like you, right? If you have haters, that means you’re doing something right. Trolls indicate success. You don’t get speaking gigs at events like NMX, BlogHer, and SXSW. Advertisers don’t want to work with you. You’re left off the “top bloggers” lists and passed up for awards, both of which can land you lots of traffic. People don’t consider you for cool partnership ideas. Others in your industry don’t promote your stuff. Can you be successful anyway? Sure. But it will be an uphill battle. 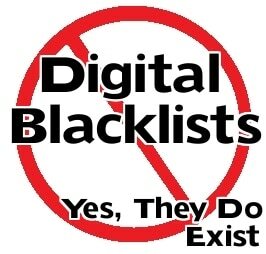 Basically, when I say “digital blacklist,” I mean that people – more than just a few – have mentally decided they don’t want to work with you or support your work. You talk badly about people behind their backs. Not venting or even complaining, but being downright nasty or snarky. If I hear that, I’m going to assume you speak badly about me too when I’m not around. You’re unfair to others in your niche when you produce your own content. I think we have a duty to call people out when they do stupid things, but we have a responsibility as members of the media to be fair and honest when we speak negatively about people in a public way. You aren’t completely honest. Maybe you’re not a big fat scam artist, but if you fudge your numbers or tell little “white” lies to get ahead and I find out about it, I’m going to assume that you lie about other things as well. You act like a diva. Name the most popular blogger or podcaster you know. Now go to the grocery store and ask ten people if they recognize that name. I bet you at least 9 out of ten will have no idea what you’re talking about. Be humble, because no one online is that famous, and certainly even if you are very successful, you didn’t get that way without the help of others. When you act like a diva, it’s a huge turn off. You don’t have time for people. We’re all busy, but if you constantly commit when offered cool opportunities and then blow people off, people are going to stop asking you to commit. Your personal life is questionable. Yes, I know you can still be an awesome blogger even if you’re cheating on your husband and you can still be the best podcaster in the world even if you’re a deadbeat dad. But online, people care about who you are personally, and if who you are isn’t a very nice person, it makes people less likely to want to work with you. We all make mistakes. Today’s your day, that day you start mending your relationships. If you’ve messed up, say you are sorry – and mean it. Follow that up with actions that show you are sorry. If someone else messed up, talk with them and forgive. You don’t have to forget or trust someone, but realize when someone is trying to make amends. Digital blacklists do exist, but online forgiveness exists too. Think of it like a personal credit score. If you’re a scumbag, your credit score is going to drop lower and lower, but that doesn’t mean you can never rebuild it. It’s a lot harder to earn back your good credit score than it is to mess things up, but with hard work and commitment, you can repair your relationships and grow as a person so people no longer blacklist you.